Its a place most of us will never know, the North, but we can know it through the journals and memoirs of those who visit and return, decked out in experience, noticeably changed. One senses there are those for whom a visit to somewhere new is a return, a sense of belonging as if the very ground reaches up and says do you remember? I will never visit the North I bet but I have visited parts through the medium of journalists who write like artists. 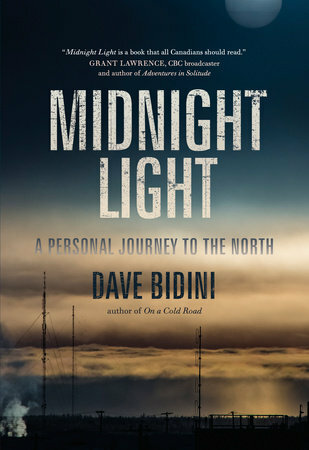 I am lucky to know a few, and we are lucky to know Dave Bidini and fortunate to have his new book, “Midnight Light” as a document. This is an absolute joy to read as his writing just flows, inspired, unencumbered, passionate, his joy at being there, his thrill of living loud, leaps off the page. He consumes it all, the edge of the world and the caravan of characters who populate it. They emerge from the pale in all their raw bloodiness, kind, cautious, interested, introspective, seekers, hiders, First Nations and the last of their ways, the young, the very elderly, and right there in the middle of it, the muddling, middling middle of it a newspaper seeking the new. Bidini was there as a journalist, getting as close to the truth of the North as was possible - and its as if he cupped it all in his hands, came South and gently, opens up - there in his palms, a globe of midnight life captured in light.